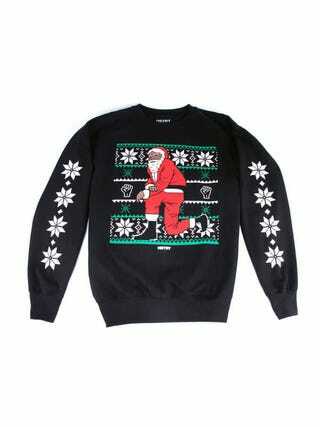 In the spirit of the holidays, Nas has released a black-kneeling-Santa sweater line through his clothing brand HSTRY. The black-Santa sweaters are available in red, black and green, and a portion of the proceeds will benefit a worthy cause. The Center for Court Innovation is a nonprofit that “seeks to help create a more effective and humane justice system by designing and implementing operating programs, performing original research, and providing reformers around the world with the tools they need to launch new strategies." The organization was founded as a public-private partnership between the New York State Unified Court System and the Fund for the City of New York. Over the last several years, Nas has been outspoken about the justice system and prison reform. The sweaters cost $45 each and not only will keep you warm but also benefit others in the process.